Serve alone or with vanilla frozen yogurt and a sprinkle of low-fat granola. Makes 4 servings. 1 apple per serving. 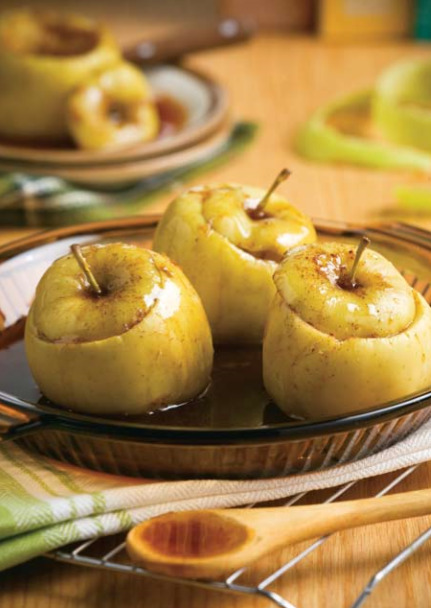 Place apples in a microwave-safe baking dish. Fill each apple with an equal amount of raisins. Combine all remaining ingredients in a small bowl and pour over apples. Cover with plastic wrap and microwave on high for 5 minutes or until apples are tender. Carefully remove apples from the dish with a slotted spoon and set aside. Place baking dish back in the microwave and cook on high, uncovered, for 3 to 5 minutes more or until mixture has thickened to a glaze. Drizzle over apples and serve while hot.